Earthworms, known in some places as “night crawlers”, are a favorite meal for woodland Woodcocks, such as the Eurasian Woodcock. The Eurasian Woodcock (Scolopax rusticola, like the American Woodcock (its American cousin, Scolopax minor), is not a flashy or flamboyant bird, like a Peacock, Turquoise-browed Motmot, or Lilac-breasted Roller. Rather, the Eurasian Woodcock prudently prefers to keep a low “behind-the-scenes” profile. Called “Waldschnepfe” (“wood snipe”) in German, this bird loves “wet woods” and other moist areas dominated by trees, unlike similar-looking wading shorebirds (like sandpipers and phalaropes). With its woodland-blending cryptic camouflage plumage, it is easily by-passed by busy woodland hikers in mixed hardwood-evergreen forests — and, more importantly, by potential predators. Its hidden-in-plain-view plumage mixes a mottled mosaic of greys and brown, with wavy bars and patches of reddish-brown russet, buff-beige, and dark-chocolate browns, woven in here and there. The rest of their lives, however, are conducted in the obscurity of night, usually in deep cover where they can feast undisturbed on earthworms and other invertebrates. Even if you were to chance upon an incubating female during the day, the bird’s camouflage amongst leaf litter is so effective that you would most likely walk past by unawares. Guided by its far-back-and-high-set eyes (which have 360O monocular vision), its long thin bill, like that of sandpipers and snipes and phalaropes(its water-wading cousins), is used for probing and picking edible material from or under wet surfaces, such as wet sands, muddy meadows, and moist thicket soil. And the Woodcock’s bill is routinely successful at frequently finding food, mostly earthworms but also bugs (and their grub-formed larvae), snails, and seeds. The Woodcock is a hidden yet hungry hunter! Woodcock also love damp forests where they can use their sensitive, almost rubber-like bill to probe the soft ground for earthworms, for which they have a voracious appetite — research with captive birds has shown that they can eat their own body weight (about 300 grams) in earthworms each day[!]. It is therefore likely that very dry summers, such as that of 2003, have a negative impact on the [Woodcock] population. Eurasian Woodcocks are migratory birds, with about 9/10 of them breeding in the cool wet woodlands of Scandinavia, Finland, and Russia, later migrating to overwinter in milder regions all over Europe (as far as the Mediterranean Sea, and sometimes even farther southward) and the Indian Subcontinent. However, some Woodcocks are year-round residents of some of Europe’s mild-climate countries, such as the British Isles, and in southern (and western) Europe, as well as in some of the mild-climate islands of the Atlantic Ocean, including Britain’s Channel Islands and Spain’s Canary Islands, as well as Portugal’s Azores and Madeira. Because the Eurasian Woodcock’s migratory range — and, to a smaller extent, its year-round residential range, — is so far-reaching, it is no surprise that many countries have honored the worm-devouring, woods-dwelling Woodcock with postage stamps. 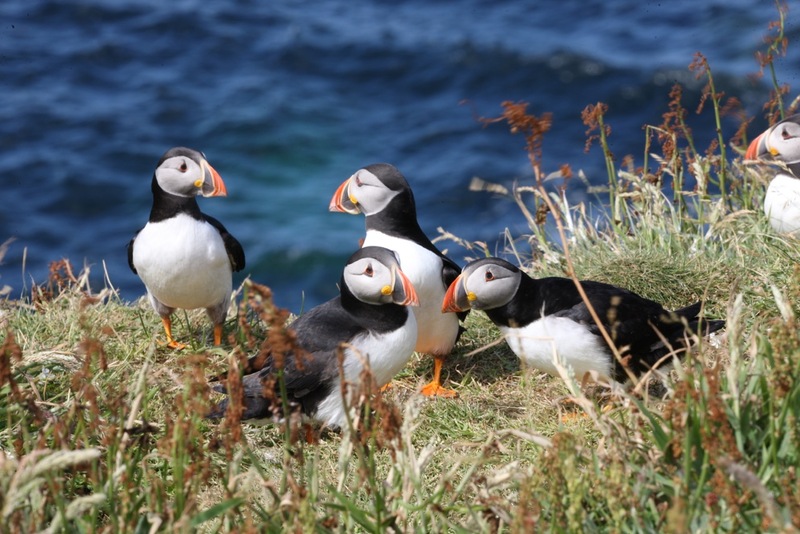 These Atlantic Puffin’s photo was taken by Bill Boothe, MD, in the Isle of Mull, Scotland. Dr. Boothe is a long time friend of Dr. James Johnson. It would have been nice to have been there also. This puffin (Atlantic Puffin) has a black crown and back, pale grey cheek patches and white underparts. Its broad, boldly marked red and black beak and orange legs contrast with its plumage. It moults while at sea in the winter and some of the bright-colored facial characteristics are lost, with color returning again during the spring. The external appearance of the adult male and female are identical though the male is usually slightly larger. The juvenile has similar plumage but its cheek patches are dark grey. The juvenile does not have brightly colored head ornamentation, its bill is narrower and is dark-grey with a yellowish-brown tip, and its legs and feet are also dark. Puffins from northern populations are typically larger than in the south and it is generally considered that these populations are different subspecies. This photo was take in Mull, Scotland. 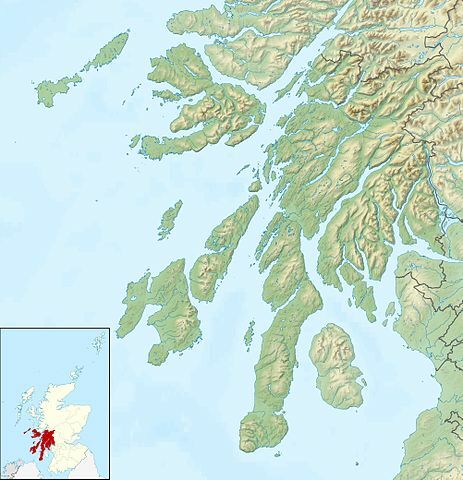 “Mull (Scottish Gaelic: Muile, pronounced [ˈmulʲə]) is the second largest island of the Inner Hebrides (after Skye), off the west coast of Scotland in the council area of Argyll and Bute.